So what’s the deal with Walmart? Where is Kohl’s growing? 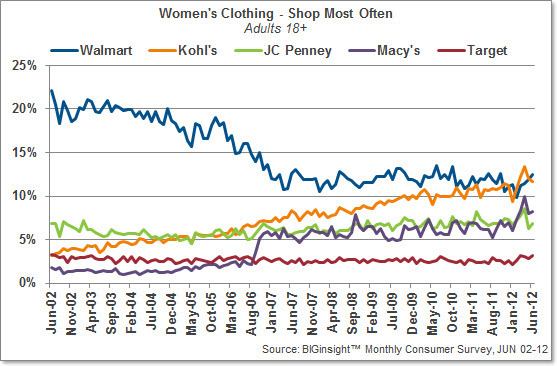 And, are JC Penney or Macy’s posing immediate threats to the top two? For Your Understanding this month, we’re taking the Women’s Clothing catfight to the mats, courtesy of our Retail Ratings Reports*. 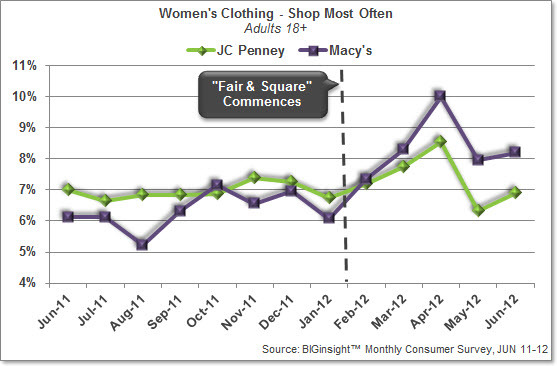 – Among the fashion forward set – a faction growing in number – Macy’s is shopped most often (16.6%), followed by Kohl’s (11.2%), and JC Penney (8.2%). – Walmart’s core shoppers earn under $50,000 – and the discounter leads with these wage earners. However, among both the lucrative $50,000+ and $75,000+ income groups, Kohl’s, Macy’s, and JC Penney are the top stores shopped for Women’s Clothing, respectively. 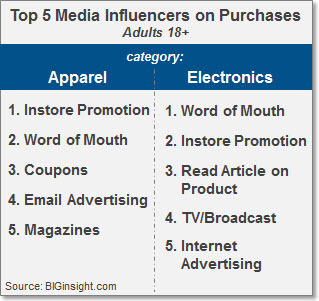 – Kohl’s (11.2%) and Macy’s (10.8%) also lead when it comes to 18-34 year old customers. Walmart’s strength lies with consumers 35-54 and 55+, though the discounter still plays second fiddle to Kohl’s in both cases. – Kohl’s and Macy’s are the top Women’s Clothing stores shopped in the Northeast, respectively, while their roles are reversed out West. Kohl’s (#1) and Walmart (#2) control the Midwest, and down South, Walmart maintains its stronghold (followed by Kohl’s). – While Kohl’s has recently overtaken Walmart for the top spot in Women’s Clothing overall, it appears that Macy’s may enter the mix as 2012 gets underway. 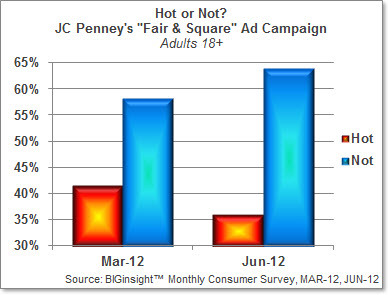 From January to April 2012, share of Adults 18+ shopping the department store standard have increase 60%+ to a current 10.0%. – Finally, don’t discount JC Penney. 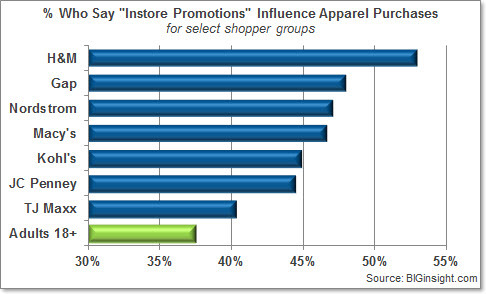 Thanks to the retailer’s promotion-less new Fair & Square strategy, shopper interest has perked up in 2012 – in the short term, at least. 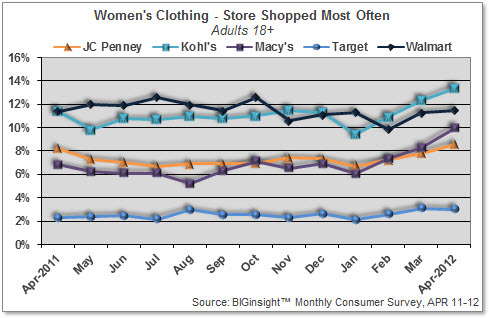 Our latest CEI ratings for Women’s Clothing shows that Kohl’s – and Macy’s – are growing in customer share, while Walmart is flatlining at best. In the all-important female shopper segment, Kohl’s share has risen 14%, Macy’s has boosted a whopping 43%, while Walmart (and JC Penney) have dropped 5%. And, recall that sweet spot of core customers for Walmart? 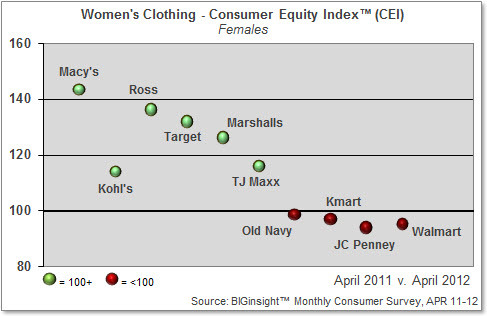 If you were to analyze the CEI ratings for those earning under $50,000/year, you would find that both Kohl’s and Macy’s are growing in similar fashion as with the female population, while Walmart has seen a flat/meager 2% pick-me-up with this group. #departmentstoredomination? Now you understand: It doesn’t appear that Kohl’s and Macy’s are directly poaching Walmart shoppers – they are growing their own customer bases (especially females and <$50,000 wage earners), while the big W’s share remains stagnant. Department stores are buzzing with consumers for 2012, and we did witness their increasing popularity for Valentine’s Day, Easter, and Mother’s Day. 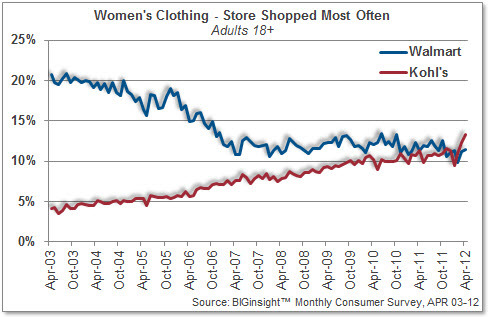 With this topic trending with shoppers, we could see some additional change-ups in the Women’s Clothing sector as 2012 progresses. Bottom Line: Perhaps Walmart just isn’t keeping up with The Changing American Consumer.